If you’re planning a wedding, right now you are likely overwhelmed with the details — choosing napkin colors, caterers, making sure Aunt Martha is seated far enough away from Uncle Bob. 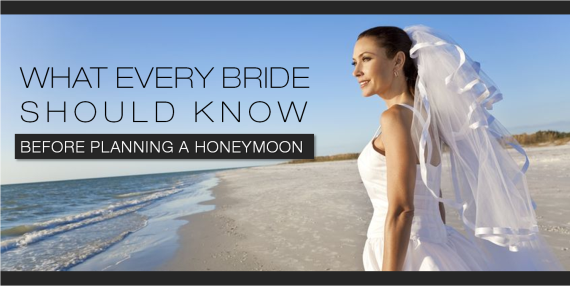 There may be many decisions that you decide to defer to a later date, but don’t put off planning your honeymoon. Your honeymoon is different than any other vacation you will take. It’s not only the start of your life as a married couple but it is an extension of your wedding. This once-in-a-lifetime vacation is about celebrating your life together. Here are 5 tips to help you plan the trip of a lifetime. 1. Plan with your fiancé: While you may be tempted to make a quick decision to check this item off your list, it’s a good idea for the two of you to plan this trip together. While it can be fun and romantic, in theory, to surprise your significant other with a trip, it can lead to missed expectations and disappointment. Talk with each other about a realistic budget and what type of trip you’d like to take. How much activity do you want? Do you want a relaxing tropical vacation sunning on the beach or do you want to visit a fun theme park? Starting your life together on the same page will make for a much smoother and enjoyable trip. 2. Give yourself a break: You have just been through a whirlwind of planning, parties and activity. Now is the time to rest and give yourself a break. Enjoy your down time together. You will be tired so the first couple of days of your honeymoon so don’t plan too many activities. Give yourself permission to sleep in, order room service and take full advantage of your hotel’s spa. 3. Be present: Once there, forget about everything but the two of you. Sure you are going to want to take pictures to preserve the memories but leave them on your phone or camera until you get home. Don’t worry about getting the perfect Instagram filter or caption. Wait until you are home to post your pictures on social media. 4. Plan some surprises: While the destination should be planned as a couple, it’s never a mistake to plan a romantic surprise once you arrive. Schedule a couple’s massage or a romantic dinner on the beach. If your significant other is a culture or history buff, look into museums or local cultural activities. Maybe have a special gift waiting in the room for your beloved. Remember this trip is all about making memories. 5. Leave it to the professionals: Planning a wedding can be one of the most stressful times in your life. But your honeymoon doesn’t have to be stressful as well. Consider hiring a vacation specialist to plan it for you. The experts know the best places for couples to stay and the no-miss places to see. Well-connected vacation specialists already have relationships with premium hotels and can get you the best deals. They will know what locations require a passport, what the weather is like and the best things to bring with you. True specialists have already been there and can help you navigate the ins and outs of whatever destination you choose. The Tropical Travelers have been planning honeymoons since 2001. This is truly our specialty. Honeymoon trends are what we read about, what we talk about and what we dream about. Our focus is to match you with the perfect place for you and your new spouse to be spoiled, pampered and begin your new life together. Contact us by phone at 1-800-479-0949 to begin planning your trip of a lifetime. Your tropical paradise does exist and we know where to find it.